The east entrance to the High Level Bridge will be closed Monday between 11:45 a.m. and 12:30 p.m. during a ceremonial gun salute for Victoria Day. The east entrance to the High Level Bridge will be closed Monday from 11:45 a.m. to 12:30 p.m. for a ceremonial Victoria Day gun salute. 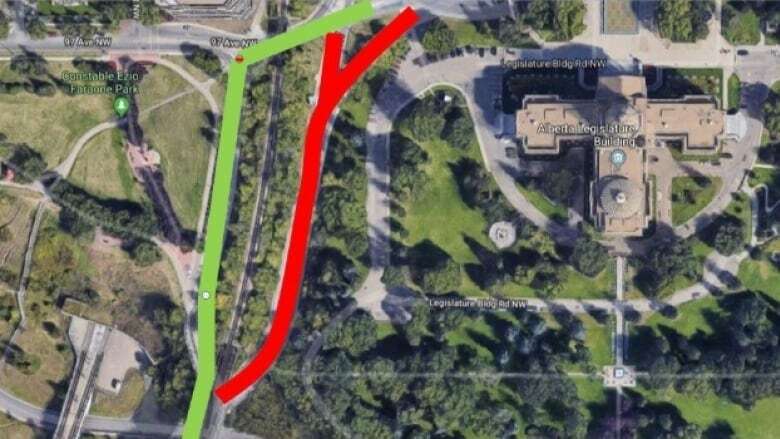 Motorists will still be able to access the bridge using the west entrance (beside Constable Ezio Faraone Park). Two Edmonton Transit Service bus routes — the 9 and the 52 — will be diverted as a result of this closure. Passengers on those routes can expect slightly longer travel times than normal between 11:30 a.m. and 12:30 p.m. The 15-gun salute starts at noon and lasts for about five minutes. Members of the public can watch the ceremony from a distance on the perimeter of the Legislature grounds and talk with soldiers afterward.